Lower expenses, a stronger balance sheet, steady growth, and a few other key things make the future pretty bright for Clean Energy Fuels. 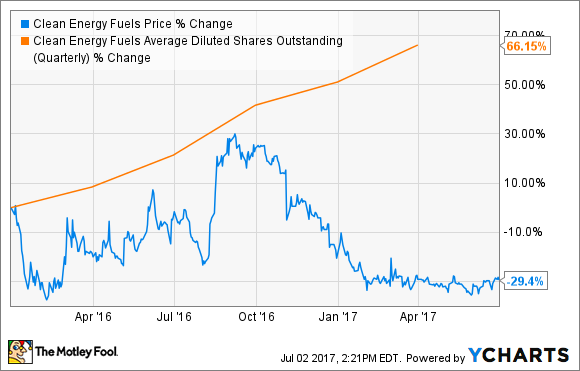 It hasn't been easy being a Clean Energy Fuels Corp (NASDAQ:CLNE) shareholder over the past five years. Not only have investors watched Clean Energy shares lose more than 80% of their value, but they've also dealt with the impact of significant dilution, as the company issued and sold millions of new shares to deal with a ton of debt on the balance sheet. Toss in the challenges of competing against cheap oil in the worst downturn in years, and it's been a painful trip so far. But even with all the struggles, there remain a lot of reasons to be hopeful that Clean Energy can still make for a solid investment. After all, even with the tough competitive environment, the company has managed to continue growing fuel sales, opening new stations, and expanding its customer base. Put it all together, and there are five solid reasons investors should be hopeful for a turnaround in Clean Energy Fuels' stock. Keep reading to learn what they are. When oil prices began falling in 2014, the biggest concern for Clean Energy Fuels was that it would lose one of its most important competitive advantages, which is also a major reason commercial-vehicle fleet operators would make the switch from diesel and gasoline to natural gas engines: low price. However, even with the big drop in oil prices making gas and diesel about one-third cheaper, natural gas remains a compelling and affordable transportation fuel. And Clean Energy has steadily grown gallons sold each year by pretty sizable rates. Data source: Clean Energy Fuels filings. Its rate of growth in 2016 was the lowest in years, but in the past two quarters, growth has started to pick up. After reporting a 7.7% uptick in the fourth quarter of 2016, the company reported 10% fuel volume growth to start 2017. What makes this number so important versus, say, revenue? First, since fuel prices are so volatile, it's a better measure of growth in the company's core business. Second, since the company's per-gallon margin is generally unaffected by the ups and downs of commodity prices that can affect revenue, following this key metric is critical to tracking Clean Energy's success in growing fuel sales. And while the bad news is that those stations have been slow to see much volume growth, with the heavy-duty trucking segment so far being the slowest to adapt to natural gas, the good news is that even at the current rate of capital spending, the company is still able to fund station growth. In March, co-founder and CEO Andrew Littlefair said the company needs to spend only $6 million per year for capital maintenance, leaving another $16 million from the $22 million capex budget for 2017 fund new stations the company will own and operate. Furthermore, a significant portion of Clean Energy's business is building and selling stations to end users, such as public transit and solid waste fleet operators that may prefer private stations with overnight refueling capabilities. In these cases, Clean Energy almost always signs long-term service and maintenance agreements when it builds a station for a customer, and it continues to generate recurring revenue from fuel volumes at these stations, too. In other words, Clean Energy is in an enviable position in that it can spend a small amount of capital to continue expanding its base of owned, public stations, and it can also build and sell stations that end users will pay for while Clean Energy runs and maintains them. 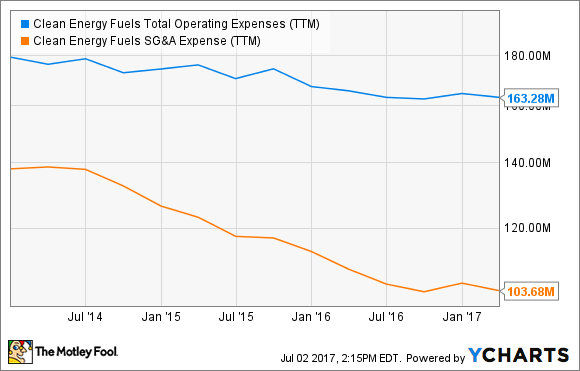 Even as the company has added new stations and grown fuel volumes, management has made huge strides in lowering operating expenses -- and they could fall even more. After the recent sale of its RNG production facilities to BP, the company expects operating expenses to fall another $3 million, while significantly lower debt will cut interest expense by more than half from the peak. And while this has been painful, it hasn't been without purpose. 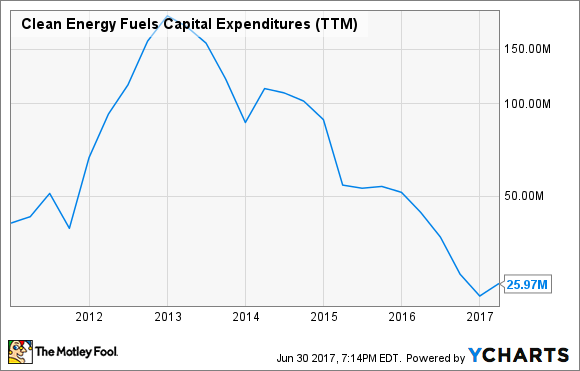 Since the beginning of 2016, Clean Energy has cut its debt in more than half, dealing with a major worry for investors -- and a big expense. At last report, the company had $98 million in cash on hand, but that amount didn't include an additional $123 million the company received from BP early in the second quarter. That gives the company nearly as much cash as debt -- both a margin of safety and a tool to further lower expenses by retiring more debt. It also means shareholders shouldn't see any more major dilution going forward. On May 31, the company terminated its "at the market" program, formally moving on from a painful period for shareholders. There is some uncertainty around the final impact of the sale of the RNG facilities to BP on the company's margin and operating cash flow, and on the lack of clarity around the expiration of a tax credit that Congress has yet to take up for reinstatement. But full-year expenses are set to fall even further on a cash basis, with the significant cut in debt, the lower operating expenses following the BP sale, and the additional cash flows from continued volume growth. Put it all together, and you have a company that's steadily growing in a competitive environment few detractors expected it could -- all while it's operating with significantly lower expenses, and with a solid balance sheet. It's been a painful few years, but there are definitely reasons investors should be hopeful -- even confident -- going forward, with a chance to deliver serious market-crushing returns.